Wembley will always hold a special place in the heart of many speedway fans, whether their favourite memories are of watching Lionel Van Praag, Bruce Penhall or from any point in between. This new double DVD from Retro-Speedway reflects on all the speedway activity at the Empire Stadium, both international and domestic. The first meetings were held in 1929 with the first league action taking place the following season, with the Wembley Lions joining the Southern League. The Wembley authorities were unhappy with early results and called in the legendary (even then) Johnnie Hoskins to improve things. The DVD includes a short interview with an elderly Hoskins relaxing in his armchair and looking back on his Wembley experience. As well as being the home of the Lions, Wembley was also the home of the World Individual Championship Final. The first final in 1936 was won by Lionel Van Praag after a run-off with Eric Langton. Langton (who died in 2001) is interviewed and claims that he and Van Praag made a gentleman's agreement before that race, though things didn't exactly go to plan, for Langton at least. Australian historian Jim Shepherd and Van Praag's daughter give their views, though it seems the truth will never be fully established. These interviews were conducted by Tony Durant who has previously produced videos on the Van Praag story. The World Finals themselves are probably more heavily featured here than the domestic affairs of the Lions. An approach that will make this DVD of more general interest than one focussed solely on the club. When speedway resumed after the war it became a challenge to find sufficient riders to fill the teams. Wembley decided to train their own men and there's footage here (reportedly) of newcomers taking some early laps around the Empire Stadium. The Lions aimed to build a strong team of English riders and put a strong emphasis on physical fitness and we see some Lions (including Split Waterman) throwing the medicine ball around in the gym. Some of the content may be familiar to those who purchased the Speedway Star VHS video history of Wembley back in the nineties. This footage, voiced by Peter York, is used selectively to good effect and it's a sensible decision to reuse such excellent material. Throughout both discs there's an excellent mix of new and old content as film, interview and still photographs combine to tell the story. One of the biggest names associated with Wembley was Tommy Price, the 1946 Star Champion and 1949 World Champion and a Lions rider from 1935 until 1956. Fittingly, there's a lengthy tribute to him. Price died back in 1997 but gave an interview in his latter years which is included on the DVD. He recalls how the aforementioned Hoskins one told him he'd never make it as a rider, a prediction that Price delighted in reminding him of from time to time. The most remarkable footage on the DVD is probably the colour film of the Lions visiting Birmingham in the early fifties. A rare splash of colour from an era generally now only seen in black and white. Freddie Williams was another Wembley Lion who won the world title on his own track. There's an extensive interview with the Welshman, given in 2012 and only eight weeks before his death. Tony McDonald is the interviewer who asks Freddie to reflect on his time as rider and as manager. He tells some great tales from his many years with Wembley, about his sudden retirement and even acting with Richard Burton! Tony also attended Freddie's funeral and was able to collect warm tributes from Brian Crutcher, John Chaplin and Freddie's son David. Williams was appointed team manager when the Lions returned for a final fling in 1970 and 1971. Trevor Redmond had re-launched the club after negotiating a lease on the famous old stadium and purchasing a British League licence from Coatbridge. Dave Jessup, Ove Fundin and Bert Harkins were amongst those who pulled on the Lions' race jacket in those years. Harkins, one of speedway's most popular characters, talks us through this happy period in his life in an interview recorded at the Speedway Museum. His passion for the sport and the Lions in particular remains undiminished even after so many years. Mark Lewisohn was a teenage fan in the Wembley stands during the early seventies renaissance and went on to become the world's leading authority on The Beatles. He similarly remains a huge affection for the Lions and the evocative, articulate and passionate interview he gives is a pleasure to view. You may have read a transcript of some of the interview in magazines such as Backtrack and Speedway Star, but it's worth hearing it all again directly from Mark. If speedway ever needs someone to act as its advocate then Mark would be an excellent appointment. Despite the high-profile nature of the 70s revival there's a disappointing lack of footage from the era. We do see the Lions in action at Leicester, but there's surprisingly little available of the team in action at home. Perhaps an indication of just how many other newsworthy events are always happening in London? Running to three and a half hours, this DVD double disc set is a treasure trove of memories, many of them shared by individuals who have now sadly passed on. Given the many big names involved, it's as much a history of speedway itself as any track specific DVD is ever likely to be. 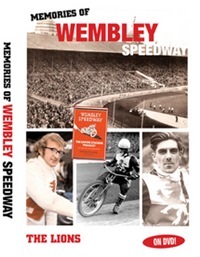 It's certainly not a comprehensive history of speedway at Wembley, but it delivers exactly what the title promises - "Memories of Wembley Speedway".